Enjoy a beautiful day of touring through the Prince Edward County countryside and savouring the flavour of locally-made, luxurious wines with a guided winery tour from County Sips. Ideal for a weekend getaway, girls’ day out, bachelorette party, or corporate team building events our tours encompass all the spectacular wineries the County has to offer. Hosted by Sommelier Ian Nicholls, you’ll obtain a wealth of knowledge about the wine-making process and revel in the deliciousness of some County wines. 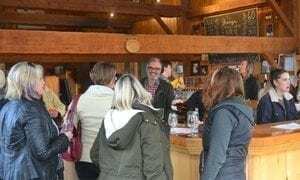 Your day starts with a pick-up location of your choice in Kingston at 9:00 a.m. and includes a one-of-a-kind epicurean tour of tasting the wine at five of the Prince Edward County Wine Growers Association’s wineries. You’ll learn about the county’s terroir and discover handcrafted, award-winning wines with an unmistakable sense of place. You will also enjoy lunch at The Waupoos Market Pub, The Swinery (at Closson Chase), Pizza at Three Dog Winery or pizza and salad, family style, at Norman Hardie Winery. Our tours can be customised to meet your wants and interests. Packages start at $135 per person. Book your day out with us now! Our tour guide, Ian Nicholls, loves to share his passion and enthusiasm for local wines with all his guests. He has extensive knowledge of the local area and the wine-making process, and will make your day fun and memorable! We tour five of the local area’s most premier wineries. You will delight in each winery’s unique blend of flavours. Gift Certificates are now available from County Sips. Give the gift of a wine tour or a stocking stuffer for the wine lover in your life. Ian will deliver in Kingston or mail to your/recipients address.